The addition of green chile adds a whole new dimension to this creamy-cheesey old favorite potluck standby. As a side dish it goes well with almost any menu. We prefer yellow crookneck, but any variety of summer squash will work. 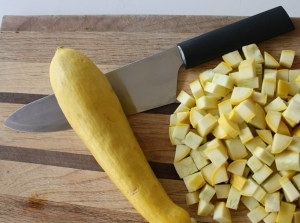 Saute the squash and onion in butter or margarine until the squash is tender. Add the flour and stir to mix. Add the milk, chile, salt and pepper. 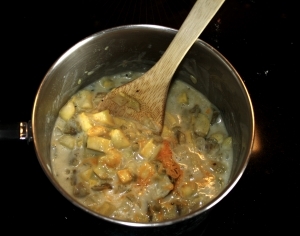 Cook over low heat 8-10 minutes, stirring gently until sauce thickens.